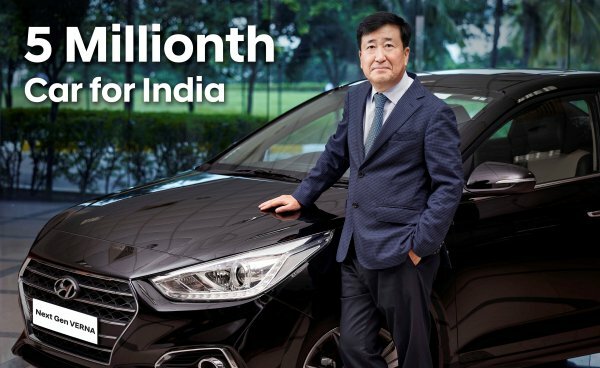 Hyundai Motors (HMIL), the country’s second largest car manufacturer and the number one car exporter since inception, is today celebrating 5 Millionth Car Milestone with the rollout of the recently launched The Next Gen Verna for domestic market. Hyundai rolled out its 1st Millionth Car, Santro, in 2007 in just 8 years and 7 months post commencement of commercial production in 1998 and continued the trend of setting benchmarks in the industry with its 3 Million Mark in less than 2 years and 8 months in July 2013 followed by next fastest 4 Million Mark in only 2 years and 4 months in Nov 2015. Hyundai has been expanding its product portfolio, foraying into new segments, strengthening the sales and service network with over 2,200 sales and service points including 422 rural outlets. The Models that significantly contributed to Hyundai’s successful journey in the past two decades include Hyundai Santro, new models Hyundai EON, Hyundai VERNA, Hyundai CRETA, i10 GRAND, Hyundai ELITE i20 & i20 ACTIVE, Hyundai XCENT, Hyundai TUCSON and Hyundai ELANTRA.